Arthur Stewart (Art) Farmer (21st August 1928 ? 4th October 1999) was born in Council Bluffs, Iowa, the son of a steelworker who went on to become a fairly well-known American jazz trumpeter and flugelhorn player. 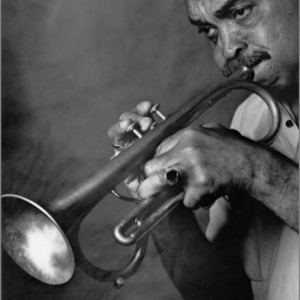 He also played flumpet, a trumpet/flugelhorn combination designed for him by David Monette. He began working out of Los Angeles from the mid-1940s, playing in the bands of Benny Carter and Jay McShann among others. In the mid 1950s he relocated to New York, and performed and recorded with Gigi Gryce, Horace Silver, Gerry Mulligan, and others. He began working out of Los Angeles from the mid-1940s, playing in the bands of Benny Carter and Jay McShann among others. In the mid 1950s he relocated to New York, and performed and recorded with Gigi Gryce, Horace Silver, Gerry Mulligan, and others. During the late 1950s he featured in recordings by leading arrangers of the day, including George Russell, Quincy Jones, and Oliver Nelson. He co-led the "Jazztet" with noted composer and musician Benny Golson. In the early 1960s he formed a small group with guitarist Jim Hall and bassist Steve Swallow. He then moved to Europe, where he performed with the Clarke-Boland Big Band. Farmer also recorded extensively as a leader throughout his later career. His twin brother, Addison Farmer, was a bassist.